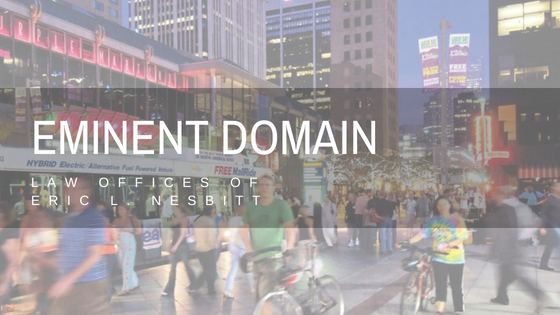 Eminent Domain - The Law Offices Of Eric L. Nesbitt, P.C. Note the language in the Constitution that “[p]rivate property shall not be taken or damaged…without just compensation,” which means that any possible damage through eminent domain must be taken into account. Therefore, a government taking only part of a property, which may damage the remaining property, is taken into account. Say a property is worth $200,000 and the government takes half, thereby causing the other half of the property to be worth $100,000 instead of $125,000; the government would pay $125,000 for half the property plus an extra $25,000 for damaging the other half. As stated, this Colorado takings right is limited to a public use standard. There is, however, no specific standard, test, or formula to determine what is considered public use. It is reasonable to assume that a taking to build a highway is public use, but a taking for a planting shrubs next to a highway is questionable. At the federal level, the 2005 United States Supreme Court case of Kelo v. City of New London is telling about the extent of eminent domain. In that case, the city of New London, Connecticut sought to use eminent domain so that it can condemn a residential neighborhood and use that land to build a large complex for pharmaceutical giant Pfizer. The idea was to spur economic growth for the city by bringing in a large employer. The city claimed that this was for the public good. The residents fought the city and the case went to the Supreme Court. The Supreme Court ruled in favor of the city, demonstrating that public good need not be strictly where the government operates something like a highway. Even greater economic good can be a public use. It is unknown whether such an argument works on a state level, but this case is persuasive. Eminent domain questions? You need an attorney who knows the law. For questions about real estate legal needs in Colorado, contact the Law Offices of Eric L. Nesbitt, P.C. at 303-741-2354 or Info@NesbittLawOffices.com.